The Food and Land Use Coalition (FOLU) formally launched its Ethiopian national program at a government-hosted meeting of the Climate Resilient Green Economy initiative in Addis Ababa on 15th May 2018. Ethiopia is one of the first countries in which the Coalition is launching a national program of work, including both mid-term policy recommendations and long-term science-based pathways. This reflects the country’s vision and leadership on the food and land use agenda. FOLU ambassador Agnes Kalibata delivered a keynote speech, offering fresh perspectives on the Coalition’s approach and ambition in the country. Attendees included Khalid Bomba (CEO, Agricultural Transformation Agency) and Ato Belete (former Minister of Environment). To accompany the launch, Paul Polman and Gemedo Dalle collaborated on an op-ed about the opportunities in Ethiopia’s food and land use systems. The piece was published in the Addis Fortune in the days preceding the launch. Read the article here. With a team already in place in Ethiopia, the launch was an opportunity to further build relationships and awareness of the Coalition’s work among key audiences and potential partners. Collaborating across sectors to drive change. 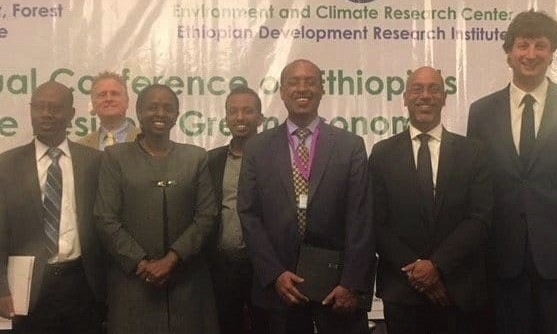 Meanwhile, the FOLU country team continues to work closely with a wide range of actors across sectors to deliver on Ethiopia’s ambitious environmental targets while creating opportunities for local communities and businesses. The Coalition is working to develop a package of policy recommendations for sustainable food and land use systems, in close collaboration with the Ministry of Environment, Forest & Climate Change (MoEFCC), the Ministry of Agriculture & Livestock (MoAL) and the National Planning Commission, as well as several well-known non-governmental organisations working in this field. The coalition is also working to shape the five-year Growth and Transformation Plan (2020-2025) and integrate the FOLU approach into the Agricultural Transformation Agency’s Agricultural Commercialisation Clusters, in collaboration with Synergos. The coalition seeks to accelerate action and bolster its policy recommendations by assessing restoration business models and pilot projects. The country team is investigating the potential to scale and learn from initiatives, including examples from FARM Africa, Komaza and Valley International. Building modelling capacity. The FABLE Consortium has launched a country team in Ethiopia to work on science-based targets and long-term pathways. The modelling work will be led by the Ethiopian Development Research Institute (EDRI). The pathways that come out of the modelling will inform the policy advice and wider work that the Coalition is conducting in Ethiopia. Read more on the FABLE Consortium’s progress.